If you enjoy camping, or are perhaps considering taking your first camping trip in the great outdoors, then a camping hammock can be a great investment. By suspending your sleeping position, you get a naturally comfortable bed for the night without having to haul around any heavy and cumbersome padded sleeping bags or ground sheets. In this review, we're going to take a look at a camping hammock by Sunyear. It is one of the more popular models of camping hammock out there right now, and it has a very competitive price tag. We're going to take a good close look at it, take in its pros and cons, and try to determine if it could be the right hammock for you. This product is available as either a single or double camping hammock. It comes as a complete kit, including 10 feet hammock tree straps and steel carabiners. The hammock comes complete with a built-in mosquito net too, which comes with its own set of net ropes. Both the hammock body and the mosquito net are made of heavy-duty, parachute-quality Nylon. The entire kit comes packed inside a handy storage bag. The combination of high-quality materials and easy installation makes this a great option if you are looking for your first camping hammock. There is also the big benefit of getting everything you need neatly packed and delivered in one kit. With that said, it is also a great hammock for just about anyone looking for a well-priced and convenient sleeping rig. It should be noted, though, that it has no built-in waterproof protection, so it may not be suitable for winter campers, or those who sleep out in rainy or wet conditions. The better question would be what isn’t included! 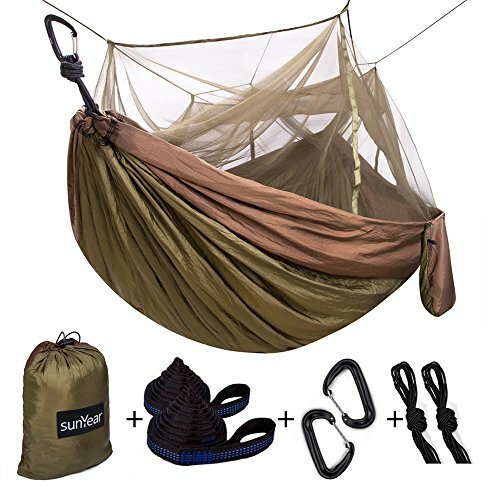 With every purchase of this camping hammock kit, you get one hammock body of Nylon construction with a bug net that is built into the design and permanently attached. In addition to that, you also get two easy setup straps (with 32 adjustment loops) plus two steel carabiners to attach the hammock to the straps. All of this is packed into a handy storage/travel bag. This handy design is packing in an awful lot of useful features! The hammock itself is designed to be both comfortable and tough, with a high-quality nylon construction employed to achieve this. The hammock also features a built-in bug net, which, according to the manufacturers at least, is of twice the density that would be found on similar products. The installation kit is great too. It’s made of tough materials and is easy to deploy—two big factors when assessing the quality of a hammock, and two factors it stands up well to. As we describe below, installation, in particular, is very fast. Once you’ve used this product a couple of times, you will probably be able to get it strung in about five minutes or so. The tree straps are connected via steel carabiners, which is another feature we are happy to see. Too many lower priced hammocks have plastic carabiners, and to our mind, they simply don’t have the strength for the job. No such worries here though. The high-quality materials plus the durable design combine to provide this hammock with a weight capacity of 500 pounds (single) and 600 pounds (double). It all folds up into one small and lightweight tote bag for easy transport too. Hanging a hammock is not as hard as many people assume it to be! You basically need two sturdy trees that have conveniently grown the right distance apart from each other. That distance, as a rule of thumb, is the length of the hammock plus four feet (two feet at each end). After you’ve found your spot, wrap the straps around two trees of the right distance, string the hammock up to the attached carabiners, and away you go! Yes, it does need a little practice, but what doesn’t in life? Trust us, after you have hung your hammock the first couple of times, going forward, you’ll be able to get it hung in five to 10 minutes at most. As we mentioned, while this hammock does have a number of very useful features, it lacks any kind of waterproof protection. If that sounds like something that you could use, then check out this product from Sun Society. Despite its…well, sunny name, it is also a very good product for camping out in the rain. This is because of the waterproof rain fly that is included with this model. It is stretched out over the top of the hammock, essentially providing a portable roof to keep the hammock occupants dry in any rainy downpour. The Sunyear Single or Double Camping Hammock really is a very high-quality camping hammock. We are particularly impressed with the fact that it comes bundled as a complete kit with everything you need to set up the hammock packed into one handy storage bag. That makes it a great beginners hammock, though it also has the quality to be a favorite hammock for a seasoned camper. All of that for a very reasonable price makes this a real winner.